The kayaking is based in White strand which is located five minutes from Lahinch. For the Kayaking session you will get the Kayak and all the necessary equipment. They have a wide range of high quality kayak equipment and wetsuits suitable for beginners. All customers are supplied with flotation devices paddle, seat, helmet and wetsuit. 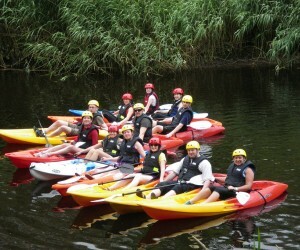 Kayaking is the perfect activity for Hen or Stag parties, you are guaranteed to have fun! Also available Kayak tours from Lahinch and from the Falls Hotel Ennistymon all year round.